Source: Greenwich News and Graphic. Friday, April 18, 1919. Page 1. 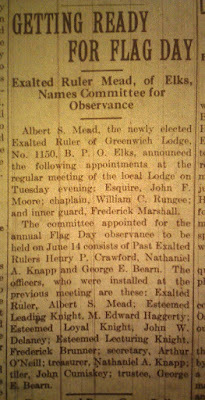 Albert S. Mead, the newly elected Exalted Ruler of Greenwich Lodge, No. 1150, B.P.O. Elks, announced the following appointments at the regular meeting of the local Lodge on Tuesday evening: Esquire, John F. Moore; chaplain, William C. Rungee; and inner guard, Frederick Marshall. 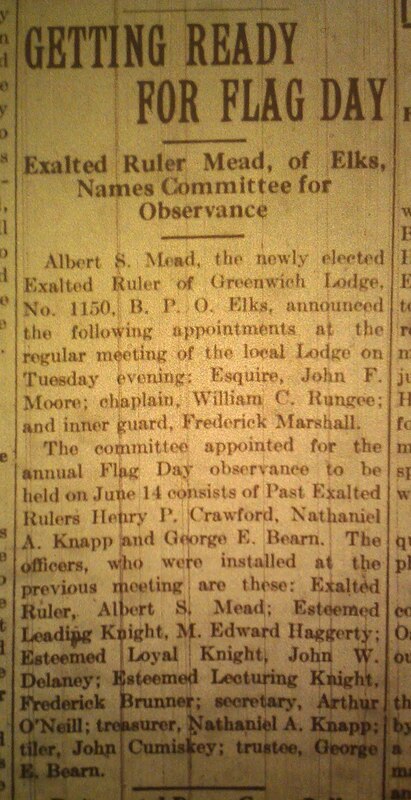 The committee appointed for the annual Flag Day observance to be held June 14 consists of Past Exalted Rumors Henry B. Crawford, Nathaniel A. Knapp and George E. Bearn. The officers, who were installed at the previous meeting are these: Exalted Rumor, Albert S. Mead; Esteemed Leading Knight, M. Edward Haggerty; Esteemed Loyal Knight, John W. Delaney; Esteemed Lecturing Knight, Frederick Brunner; secretary, Arthur O'Neill; treasurer, Nathaniel A. Knapp; tiler, John Cumiskey; trustee, George E. Bearn. Source: Greenwich News and Graphic. May 23, 1919. Mrs. Esther Waterbury, wife of Elkanah Mead, a prominent resident, died at her home on Milbank avenue yesterday morning. 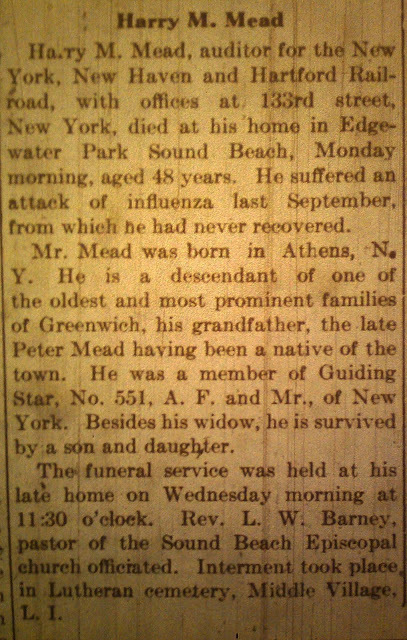 Mrs. Mead was the daughter of Mr. and Mrs. Aaron T. Waterbury, of Pound Ridge. Besides her husband she is survived by two daughters, Misses Katheryn and Winifred Mead. Source: Greenwich News and Graphic. Friday, July 11, 1919. Page 4. Source: Greenwich News and Graphic. Friday, August 15, 1919. Page 1. The orchard on the estate of Oliver D. Mead at Field Point Park was the scene of a real movie," which might have been entitled "The Wilds of Africa," on Wednesday afternoon, when a young colored girl appeared on the property as "September Morn." Aside from a pair of shoes, which she wore, she was in her "birthday suit." Judge William J. Ferris, a son-in-law of Mr. Mead, upon being told at his law office that some sort of savage was alarming the natives in that section, hurried to the estate, accompanied by Policemen Scully and McGinty. 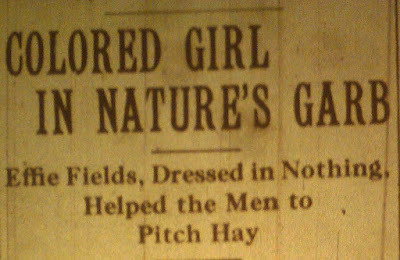 Upon arriving at the orchard the girl was engaged in pitching hay with John Bridge, Edward Sweeney and some other workmen, and was in a hilarious sort f mood. The officers wrapped a rubber coat about her, and she was taken to police headquarters. 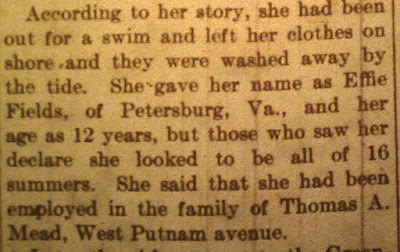 According to her story, she had been out for a swim and left her clothes on shore, and they were washed away by the tide. 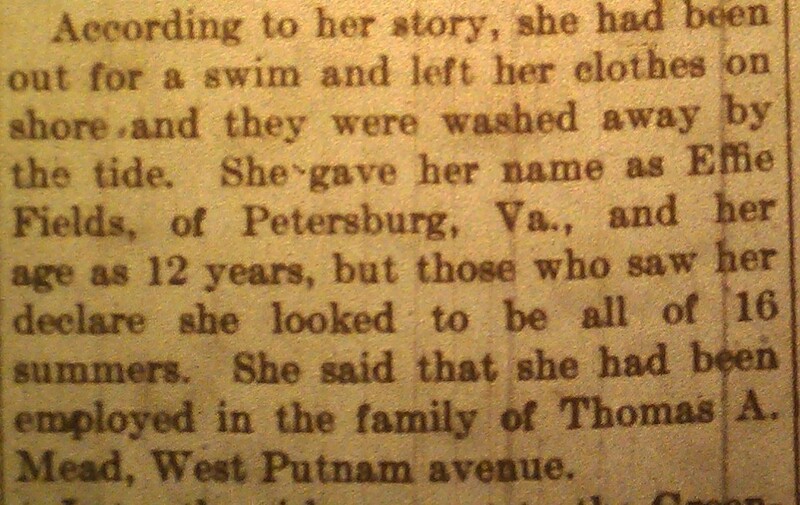 She gave her name as Effie Fields, of Petersburg, Va., and her age as 12 years, but those who saw her declare she looked to be all of 16 summers. 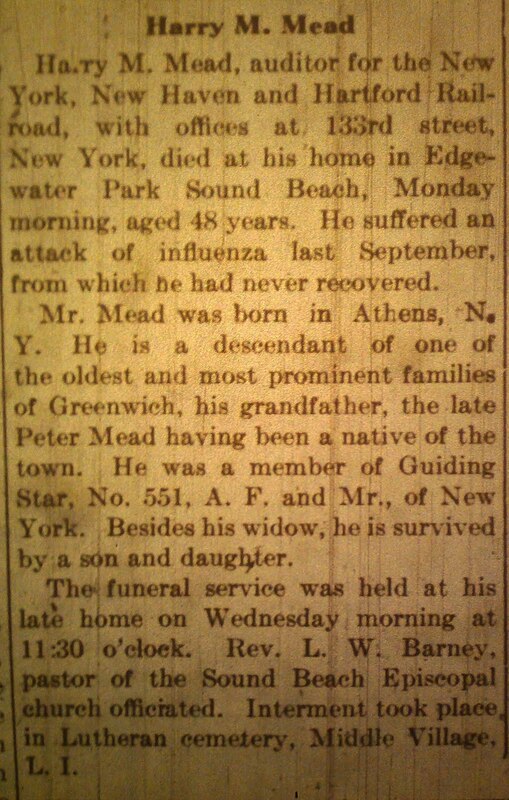 She said that she had been employed in the family of Thomas A. Mead, West Putnam avenue. 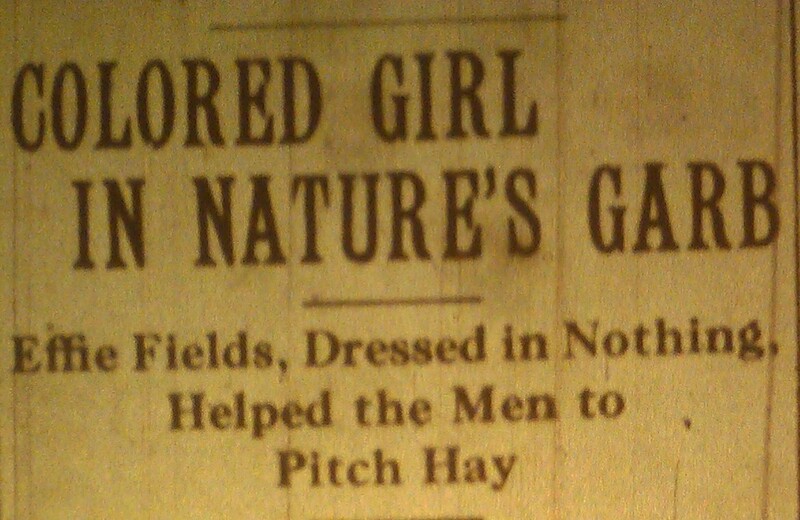 Later the girl was sent to the Greenwich hospital for treatment. It is believed that her mind is somewhat unbalanced. She has an aunt living near the Toll gate, West Putnam avenue.